I am so excited to introduce you to Jane Jane Jewelry which features a beautiful collection of unique sterling silver gemstone jewelry and modern pieces that are on trend for the season such as leather wrap bracelets, switch snap snap-button jewelry and even European style lampwork bead charm bracelets. 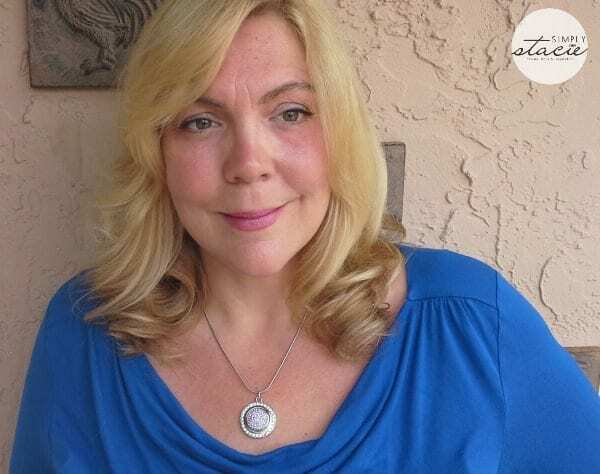 I have several treasured pieces in my own jewelry collection (the leather wraps are fabulous) by this very talented designer so I couldn’t wait to browse her latest collection showcased at Jane Jane Jewelry. One trendy piece that is absolutely stunning is the Switch-Snap Jewelry Crystal Necklace Set (SRP $34). What makes this jewelry set so creative is that it is actually three necklaces in one. 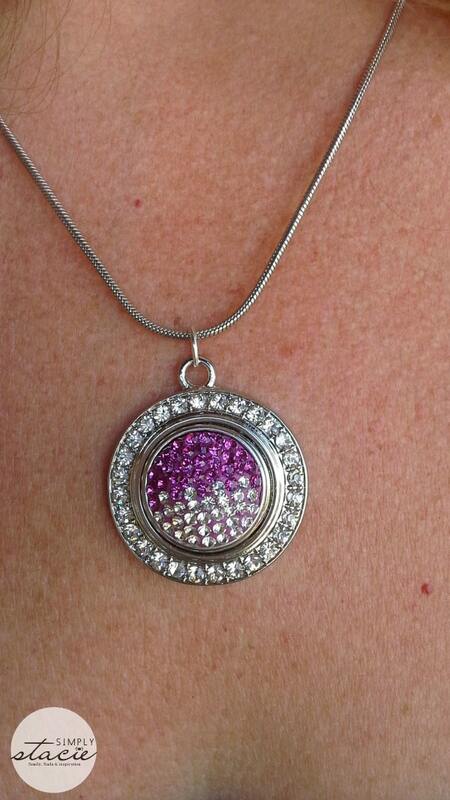 It has a snap in pendant base so that I can easily switch between the crystal snap charms. 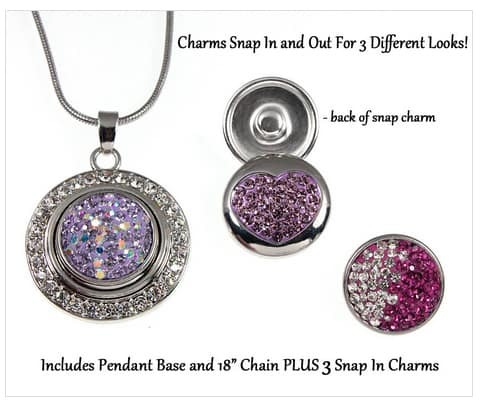 It features three stunning snap on charms i.e. Purple & Pink Multi, Berry and White and the Pink-Purple Heart which are surrounded by dazzling white crystals for a beautiful sparkle. It also comes with an 18” stainless steel necklace that will not tarnish or irritate my sensitive skin. The lobster clasp keeps the necklace securely closed and I love that it has a 1.5” extender so I can change the length of the necklace to my preference which is usually longer. This necklace set makes changing my look to match my outfit or any special occasion a breeze. While this piece is very attractively priced the designer does not sacrifice on the materials used in her creations. It is an extraordinarily high quality set that has become my new favorite. It is so easy to change out any of the crystal charms as you simply snap it in and out like a button. You can even add to your Switch-Snap jewelry collection by selecting additional pieces since it can be mixed and matched for virtually limitless looks. In addition to the Switch-Snap necklaces you can also coordinate these with the Jane Jane Jewelry bracelets and rings too. My husband does not always notice my jewelry but when I wore this necklace on our recent date night out on the town he was very complimentary. My sister-in-law who was visiting also hinted that she would absolutely love this necklace for her upcoming birthday gift. It comes in a pretty gift box so it is ready to give to someone special who is sure to treasure it. It is a real statement piece that is sure to get lots of positive attention because it just lovely! You are invited to visit Jane Jane Jewelry to purchase your favorite piece of Switch-Snap Jewelry and browse the entire collection to find your perfect piece to give or receive. When you purchase jewelry from Jane Jane Jewelry you can feel confident that you are getting a unique, designer piece that is high quality and beautiful! I love the jumping fish! I love the Tree of Life Ring in SIZE 7 in 925 Sterling Silver. I like the celtic everlasting knot pendant…very pretty! My favorite piece of jewelry is the Amethyst and Sky Blue Topaz Gemstone Ring. I absolutely love dragonflies, so of course my favorite piece is the Moonstone Dragonfly Pendant Handcrafted 925 Sterling Silver. My daughter likes the Celtic Heavyweight Square Pendant for Men and Women 925 Sterling Silver. I like the Switch Snap Jewelry : Gray Quartz Watch Pendant Necklace with 2 Extra Switch Snap Jewelry Charms 30 Inch Chain. I love the Moonstone Dragonfly Pendant Handcrafted 925 Sterling Silver. I love the Sterling Silver Artistic Oval Link 7 Inch Bracelet. I also like the Pearl Dangle Earrings 925 Sterling Silver with CZ Accents!